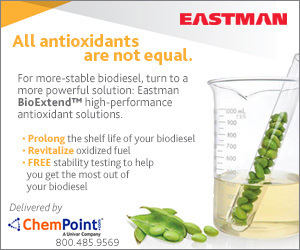 The U.S. EPA reported 148 million gallons of biodiesel production for the month of August, putting year-to-date volume at a record pace of nearly 916 million gallons. Biodiesel and renewable diesel together have already exceeded 1 billion gallons. Tri-State Biodiesel has made a name for itself in New York City as the B20 fuel supplier for Mercedes-Benz's fashion week, the B50, and now B99.9, supplier for the Twin Towers Tribute Lights, and as a premier biodiesel home heating service provider. Evofuel Ltd., a wholly owned subsidiary of Evogene Ltd., has completed three years of successful field trials in northeast Brazil for the development of castor bean as an alternative feedstock for production of biodiesel and other industrial uses. The research, conducted in early September, shows 87 percent of Iowans surveyed are familiar with biodiesel. Of those familiar, 74 percent have a positive impression of biodiesel, with just 2 percent saying they have a negative impression. Oakhurst and Maine Standard Biofuels announced on Sept. 13 that they have received a Breathe Easy Leadership Honorable Mention Award from the Northeast Diesel Collaborative for reducing diesel emissions beyond what the local laws require. USDA Rural Development Acting Under Secretary Doug O'Brien made the announcement on Tom Vilsack's behalf in Omaha, Neb., at the National Advanced Biofuels Conference. 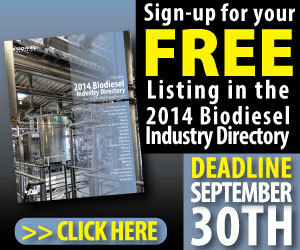 Many of the 188 recipients receiving the $15.5 million are biodiesel producers. Portuguese biodiesel technology provider Incbio announced it has signed a contract with Biokast Energy S.A. to supply an 8,000 metric ton per year (2.4 MMgy) ultrasonic biodiesel plant for installation in Tunis, Tunisia, a small North African nation. Industry leaders at the National Advanced Biofuel Conference & Expo had an adamant, clear-cut message for attendees: If there were ever a time to unite and work together as one force, it is now. Among the speakers were Joe Jobe and Gary Haer.